The superior features in terms of data quality, minimal sample volume requirements and scalability make the LUNARIS™ system an ideal choice for state of the art biomarker screening and validation. AYOXXA Biosystems GmbH, an international biotechnology company, focused on the development of innovative multiplex protein analysis technologies enabling translational research in basic and clinical research, today announced the expansion of its catalogue of immunoassays for multiplex protein analysis with the introduction of LUNARIS™ Mouse 12-Plex Th17 Kit for the quantitative analysis of soluble mouse T helper 17 (Th17) cell-related markers. The assay is optimized for usage on LUNARIS™, AYOXXA’s innovative multiplex protein analysis system. The new LUNARIS™ Mouse 12-Plex Th17 Kit comprises a panel of highly specific antibody pairs against CCL20, IFN-γ, IL‑1β, IL‑4, IL‑6, IL‑10, IL‑17A, IL‑17E, IL‑17F, IL‑21, IL‑23 and TGF‑β1. These cytokines are involved in regulating the differentiation and effector functions of Th17 cells in different pathogenic conditions including autoimmune disorders, immune-mediated diseases as well as asthma, allergy, cancer, microbial defense and transplantation. Particularly noteworthy is the opportunity to measure the active form of “transforming growth factor beta 1” (TGF‑β1) which is missing in most comparable assays. The absence or presence of TGF‑β1, in combination with other cytokines such as IL‑1β, IL‑6 or IL‑23, which are also covered by this assay, regulates the differentiation of Th17 cells and is thereby important for the final outcome and character (anti-infective or pathogenic) of immune responses. 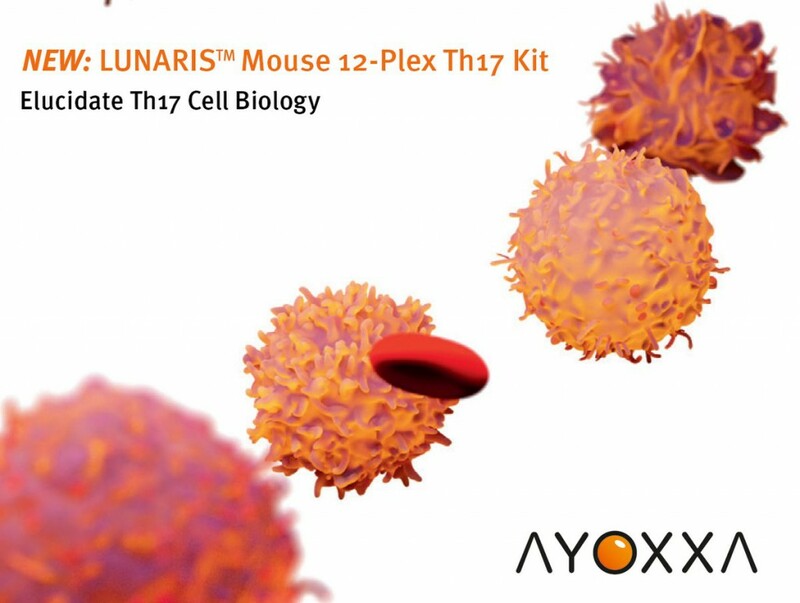 The LUNARIS™ Mouse 12-Plex Th17 Kit is optimized to run on AYOXXA’s proprietary multiplex protein analysis system LUNARIS™, an automated system that can be readily integrated into any laboratory routine and is optimized to provide an easy-to-use, standardized workflow from sample to result. It combines the familiarity of standard immunoassay workflow with unmatched capability for low sample volume, scalability for low- to high-throughput applications and market leading data quality. The system comprises a dedicated LUNARIS™ reader and best-in-class automated analysis software for image-based analysis with a 100% read-out. LUNARIS™ assays follow a classical sandwich immunoassay principle with fluorescence readout. The BioChips are painstakingly optimized using the best quality antibody-pairs to ensure the highest assay sensitivity and specificity with minimal cross-reactivity in a multiplex format. Due to the innovative BioChip setup and geometry, LUNARIS™ assays can be performed with sample volumes as low as 3 µL – which represents only 1/10 of the volume required by comparable multiplex technologies. This low minimum volume requirement enables multiplex protein analysis from valuable and scarce human and animal samples. “The superior features in terms of data quality, minimal sample volume requirements and scalability make the LUNARIS™ system an ideal choice for state of the art biomarker screening and validation. This provides AYOXXA with clear competitive advantages in the rapidly growing field of multiplex protein analysis in translational science. The growing portfolio of disease related panels like the new LUNARIS™ Mouse 12-Plex Th17 Kit fuels the understanding of underlying biological mechanisms. The robustness of the LUNARIS™ system evaluated in numerous clinical partnerships will drive the transfer of this knowledge generated in a laboratory through the entire drug development process,” said Wolfgang Kintzel, COO of AYOXXA. The new LUNARIS™ Mouse 12-Plex Th17 Kit adds to the already existing portfolio of standardized biomarker kits including human and mouse cytokine as well as ophthalmology panels. The newly introduced LUNARISTM Mouse 12-Plex Th17 Kit is available as of September 2017. The dysregulation of the balance of Th17 cells and other immune cells has been associated with a variety of pathogenic conditions including rheumatoid arthritis, psoriasis and multiple sclerosis. Th17 cells can be broadly divided into two groups, the host protective cells that express both IL‑17A and IL‑17F and IL‑10 and the highly inflammatory population which expresses IL‑17A, IL‑17F, IL‑22 and IFN‑γ. Th17 cells activated by transforming growth factor‑β1 (TGF‑β1) and IL‑6 promote mucosal defense, barrier tissue integrity and curtails immunopathogenic responses, whereas IL‑1β and IL‑23‑activated Th17 cells have been shown to cause chronic tissue inflammation during infection, granuloma formation and autoimmune response. Please follow this link to read the original press release.